The property is ideally situated both for business and leisure tourists, near the Palexpo Exhibition Center and the United Nations. Hotel Moderne offers you a 'Free Access Card' to use the bus and trains all over Geneva, which is valid during the entire stay. 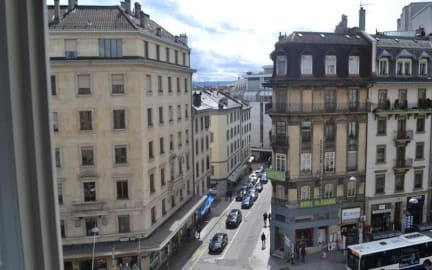 Besides the complimentary breakfast, sample delicious Italian and Japanese cuisine at the restaurant or benefit from the staff's recommendation and visit a restaurant in Geneva's city centre. Saint-Gervais / des Grottes is a great choice for travellers interested in Old Town, Sightseeing and City Walks. Hotel Moderne is a 3-star hotel where you will enjoy a very good quality of service in a warm family atmosphere. An Italian and a Japanese restaurant welcome you 7 days per week. Hotel offers you a 'Free access Card' to use bus and train in Geneva, during the whole stay in our property. Moreover, our staff will be delighted to inform you about the best restaurants in downtown, which are all close to the hotel. There are two under parking at your disposal, close to the hotel. Rent could be done per hour or per day. Our 55 rooms are quiet and equipped with soundproof windows, shower or bath; phone with direct outside line, fax and wireless system in the hotel, radio, cable and individual private safe at the front desk. WARNING: Please be aware that the reservations for 3rd, 4th and 5th of March 2014 are NON-REFUNDABLE! The reservations for these dates can not be Cancelled or Modified!